My brother’s birthday is coming up soon and I need a birthday card. 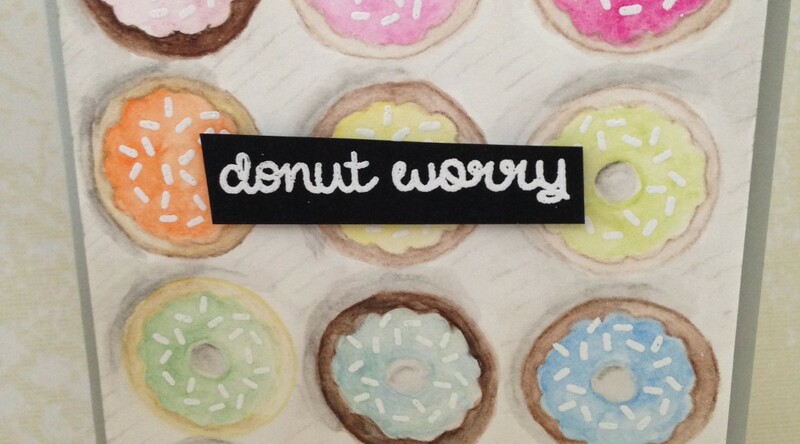 He loves donuts and I just bought the Donut Worry Stamp Set. It might have been fate. Extra Details: I began this card with a panel of water color paper. 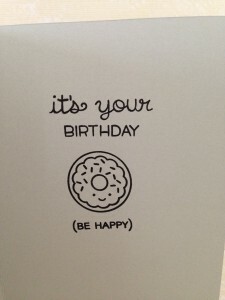 I stamped 12 donuts in Barely Beige ink. I used water color pencils to add all of the color. I blended the colors out with a water brush. Once it was dry, I white heat embossed the sprinkles for added interest. I adhered this panel to a gray card base. For the sentiment, I white heat embossed the sentiment on a scrap of black card stock. I trimmed it out with my scissors, which is why it is a bit wonky. I adhered it to the card front with foam tape. 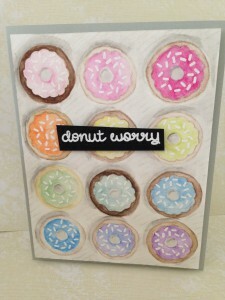 I added a sentiment and donut to the inside of the card and it was finished.